In Dallas, a birthday party held on our television show. Jimmy and Webster and You. Jimmy Weldon and Webster Webfoot have been gracious enough to give Local Legends an interview. Hope you enjoy it! 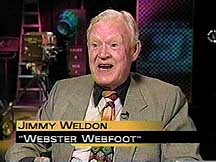 A Big Hello to Uncle Jimmy Weldon and Webster Webfoot! "It's a real pleasure to be talking to both you and Webster. Let me talk to Jimmy first. Okay, Webster?" 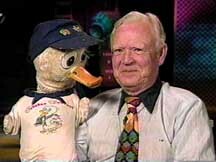 "Webster seems like a real wise cracker for a little duck. Did he learn that all on his own or did he pick some of that up from you, Jimmy?" "When Webster was 'introduced to everybody' I was a disc jockey at the first radio station where I worked ... KWCO ... in Chickasha, Oklahoma in1946. I was playing records -- a request type program -- with people calling the studio. Webster liked Spike Jones and other "off the wall recordings." He developed his personality just "as time passed." "Well, has Webster always been a good little duck or does he get in trouble now and then?" "He used to interrupt me while I was on the air and I put him in the waste paper basket till he promised to be good. (It made great audio as you could hear him begging to get out) and actually became a fun part of the show as our 'fans' would fuss at me for PUTTING HIM in there and relaxed when he 'got out' again." "Has Webster taught you anything?" "YES. We are all children when we can get away with it. The only difference between an adult and a child is just the 'cost of the toy.'" "In your book you talk about motivating people. What kinds of people or things motivate you?" "When I finish a presentation and someone tells me I have "touched their life" -- I come home on cloud nine because I truly believe you can do anything you really want to ... if you believe you can." 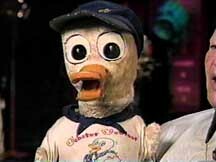 "Does Webster have any brothers and sisters, or is he an only duckling?" "No, Webster's the only one. I have had a lot of people ask me if he should have some "siblings" but I can't imagine such a thing. (smile)"
"Do you still have examples of all your Webster Webfoot toys and merchandise?" "Very few. There were Webster Webfoot dolls, caps, T-shirts, cardigans, towels, records, coloring books, and other merchandise we had as promotional materials for our sponsors, but they are long gone. I have a few items, but --- I never thought of keeping any for any value they COULD be some day." "Are there special challenges to puppetry on TV, and did you get to meet many other local puppeteers or children's show hosts?" "Today --- nothing as it was when little Webster was a personality on television. I was privileged to replace whom I believe to be the greatest ventriloquist who ever lived ... Shari Lewis. She was leaving WRCA-TV, the NBC flagship station in New York City, in 1959 to work on a new project and little Webster became the star of that show, HI MOM. Later, when we returned to Hollywood, we were replaced by a true GENIUS....Jim Henson and the Muppets. This was his first show and you KNOW how he climbed to the top of the entertainment ladder." "Do you have a preference in doing a live show versus one on film?" "Yes. FILM (videotape) is much better. Why? Live television left too much to chance. With video tape you can always correct any BAD error ... but live tv was "YOU GOT WHAT YOU SAW!" "It seems very a rewarding career, making children laugh and teaching. In your book you mentioned a bit about what went into the production of your show...How much of it were you involved in, such as writing, etc. and would you have changed anything if you could?" "No, I would change nothing. I had the greatest help any performer could have had. I helped write the stories of "Little Joe" with Hal Biard, but he was my right arm. I valued his opinions more than anyone else and he drew all the pictures in our stories." "What kind of advice would you give your grown-up audience now?" "I would beg them with all my heart to teach their children right from wrong, respect for --- well ... things ANY PARENT OUGHT TO KNOW. But there is even a larger request I would give: NEVER TELL A CHILD WHAT HE OR SHE IS GOING TO DO AS A PROFESSION! THAT CHILD is the only one who knows what he/she truly WANTS to do. ASK them what they want to do....then give them all the encouragement and assistance they need -- but do nothing FOR them they SHOULD DO for themselves. Otherwise, you are hurting them rather than helping them!!! Nuf sed." Well Jimmy, it's been great but I think it's time we let Little Webster Webfoot have the floor! "Webster, I have to ask you this first: what's your favorite holiday?" "My birthday. February 31st. "Jimmy sez there is no such date, but I OUGHTA KNOW ... it's MY birthday." <JIMMY>"(That's why he's only three ... he he)"
"Jimmy seems like a really great guy, since you've worked with him all these years, how is he really?" "You and Uncle Jimmy have worked with so many great stars, which is yours and Jimmy's favorite?" "I never got to meet him but Spike Jones and his orchestra was always my favorite. I did get to meet Sir Frederick Gas in Spike's orchestra." "Do you like ice creme and what's your favorite flavor?" "Vanilla is my very best. We used to have a chocolate ice cream sponsor and Jimmy is not a good actor because he doesn't LIKE chocolate and his wife said she could see the pained expression on his face as he tasted it and looked in the camera saying, "Mmmmm...that's so good!" (I'm telling on him.. he he he)"
"Vanilla's my favorite, too! Do you have a bedtime like all the other little ducks your age?" "Well, yes and no. If we were "speaking" somewhere together, I may not go to bed till waaaay late. And I'm 'ready to go' -- whenever. Other times I can nap when I feel like it." "What do you want to be when you are all grown up?" "Now I've never thought of that --- reeeely!" "What do little ducks like you do for fun?" "Oh, I love swimming! My favorite sport!!! I like flying and Jimmy lets me hold the wheel of his Bonanza and fly while I'm sitting on his lap..."
"Do you always look both ways before crossing the street (I hope)?" "YES! YES!!! We always told everybody to do that when my show was on television. I really enjoyed the officer who visited our show in Dallas to give my friends safety tips." "Uncle Jimmy says you're three years old Webster, but you don't look a day over two and a half! How do you stay so young looking?" "Do you have any special messages for your pals out there in TV land?" "Always remember to practice safety and courtesy wherever you are. Tell your Mother and Dad you love them and always try to make them proud of you. You can't 'go wrong' that way!" "Well, I want to kindly thank Jimmy Weldon and Webster Webfoot for the interview. I hope you both know how much you are loved and adored by your fans! Let me say "Thank You" for all the grown up kids out there that watched you and Webster faithfully. We all grew up a little better thanks to people (and ducks) like you. We love ya, Jimmy (and Webster)!" "Webster and I love you. My eyes are a bit watery after reading that last paragraph above as I think of how fortunate I am to be the recipient of such kind words. I had my eightieth birthday yesterday (September 23, 2003) and almost 54 years ago when little Webster made his debut on television, I had no way of mentally projecting that TODAY I would receive psychic rewards far greater than all the material holdings of Donald Trump. P S: Jimmy Weldon sends this into Local Legends from a fan of his. Thanks for sharing it with us, Uncle Jimmy! 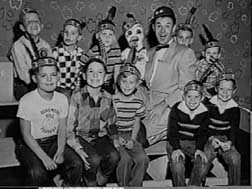 Jimmy Weldon: "Waaaay back in 1952, 1953 & 1954 we told stories of "Little Joe" each week on our television show. One of those was Little Joe the Christmas Tree who was a little runt and no one wanted him....so he was thrown out in the back of a huge supermaket Christmas Eve where all of the other Christmas trees had been sold for the holidays. Little Joe was alone lying there when a gardener found him and took him to a home near the edge of town and planted him in the front yard. He grew strong and each year the people decorated him and people came from all around to see him - a beautiful, BEAUTIFUL Christmas tree..... He lived not just to be a Christmas tree for one year but -- for all time.... Following then is self - explanatory from someone who watched Webster when he was a little boy and LOVED THE STORY OF LITTLE JOE THE CHRISTMAS TREE. I thought that you might like to see my Little Joe. The house is the first home I ever lived in. We planted Little Joe when I was about 5 years old. I am 56 now. So he is pretty old. We moved from this home in 1957 and every one who has owned it since has kept him in good shape. I hope he lives forever just as the real Little Joe the Christmas Tree lives forever in my family.